Layfield offers design services to our customers at a number of levels. At the introductory level our technical representatives can provide assistance with materials selection, availability, and budget pricing. Our construction group can provide assistance with construction timing, construction details, overall constructibility of a project, and cost estimates. 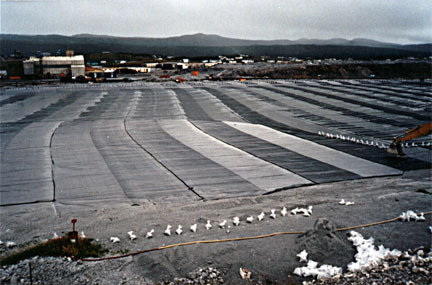 Layfield offers design services on a number of geosynthetics materials. The most common design service we provide is to provide preliminary designs for geogrids and high strength fabrics in mechanically stabilized earthen walls and embankments. Layfield can also provide design services for specialized geosynthetic products such as baffle curtains, floating covers, storm storage systems, and Geoweb products. Our design services can range from a preliminary concept, to a design suitable for engineering review, to a complete engineering design. Layfield also offers design-build services on projects where the geosynthetic component is 50% or more. Design-build solutions require involvement at an early stage in the project.